Designed for heavier storage items. 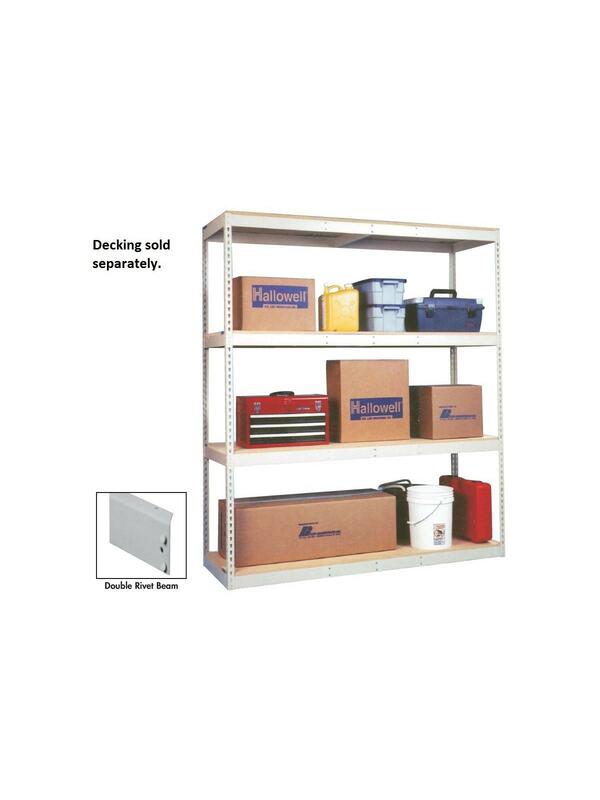 An economical storage system that provides exceptional value and versatility. Accommodating applications from light to heavy duty. 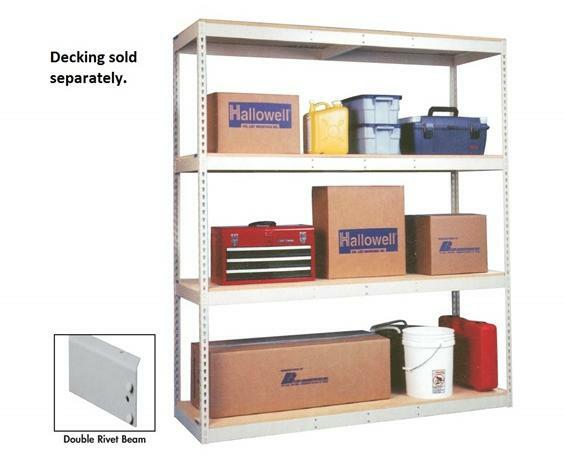 Rivetwell shelving is easy to assemble and expandable as needs change. Shelf levels are adjustable on 1-1/2" centers. No cross bracing allows access from all sides. Common T-posts between adjacent units. Attractive #729 Parchment powder coat finish. Decking sold separately. FOB Shipping Point. Similar to single rivet shelving, double rivet shelving uses double rivet beams at all levels providing increased rigidity and includes center supports for maximum shelf capacity. Starter Units consist of 4 standard angle posts, 4 left-to-right standard double rivet angle beams, 4 front-to-back standard double rivet angle beams, 2 left-to-right standard rivet beams per intermediate level and 2 front-to-back standard single rivet beams at 1 intermediate level only (30" and 36" deep units include 2 front-to-back single rivet beams at each intermediate levels). Adder Units consist of 2 standard T-posts, 4 left-to-right standard double rivet angle beams, 2 front-to-back standard double rivet angle beams, 2 left-to-right standard single rivet beams per intermediate level and 1 front-to-back standard single rivet beam at 1 intermediate level only. 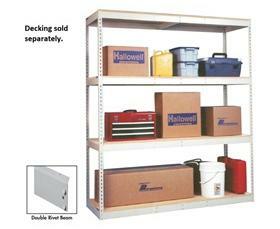 See Related Items tab for Hallowell Decking. 48 x 24 x 84"48 24 84"